This morning, as I checked my investments in the stock market, I was astonished to what I saw. Oh yes, I earned enough and it was a tremendous mark. Being a "newbie" in the stock market, those green marks gave me a huge smile. Sometimes, I really think that money is a big part of our everyday lives and generally, we can't live without it. I am blessed that I have a sufficient supply of it but I never put into my mind that this thing will dictate my lifestyle. I've been to those times of being needy so I know exactly how to be wise enough in spending and not allowing money to change me. There is a saying that money is the root of all evil. Do you agree on this? Well the Scripture doesn't exactly state this thing. Read carefully what 1 Timothy 6:10 says: "For the love of money is a root of all kinds of evil. Some people, eager for money, have wandered from the faith and pierced themselves with many griefs". When I first read this passage, I immediately concluded that yes, it is money the root of all evil. Fortunately, my spiritual leader here in Dubai opened our eyes and emphasized the words love of money. 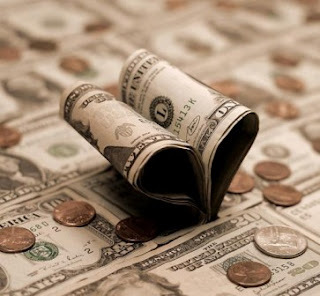 Money can be generally good or evil; it matters on how we use it. We can help others using the money and we can hire an assassin to kill a man by spending our money. It really depends on how we execute our spending manner. What generally makes the love of money the root of evil is the way on how we trust on it for what we need. It is like permitting the money to control us and depend only to it. It is a huge insult to God! Failing to have faith in Him will take away all the opportunities to have a deeper relationship with Him. We cannot take our money when we die, money will be useless in times natural disaster as only God controls it. He can immediately make us poor and strip us out of wealth. Oh yes, He is that powerful. On the other side, the love money isn't always involved in the evil things. But it becomes root in our hearts that we become blinded by its prestige and power and that we sometimes come up with incorrect decisions and ungodly things. We have been warned so we better take the necessary precautions about it. Spend wisely, save for your future and spend it only on the good way. Sharing it with others will bring you a good feeling and a priceless smile can be seen to others. The world isn't all about the money, we have family and friends and especially, we have Him who gives us unending grace and never ending love.